I’m a fan of both the Metroidvania-style of gameplay and the concept behind the randomly generated worlds for (near) infinite replayability. If I’m completely honest, the combination isn’t always easy to pull off. The maps can feel confined at times or devoid of love in the design when they are too large and empty. Then again, everything could go right and simply work out. On the metroidvania front, those are still very large boots to fill even though the original games came out so long ago and have been rehashed any number of times. A Robot Named Fight! throws its’ hat into the ring, but does it do the job well? Let me break it down for you. I had a floating helper-dude once that changed excess life into energy… and ate all of the gibbed enemy chunks on the level. Sure he was cleaning up, but there had to be better things to eat right? A Robot Named Fight! is set in the future after… apparently all of the humans are dead. There are no spoilers here by the way. While there are no humans, there are also no greater robot overlords since they left as well. Now all that’s left on the planet are the humanoid-looking robots and they are now under-siege by some funky-looking flesh monsters (not Seagal though, he’s not a flesh monster). What are they here for? Do they eat robots or do they just enjoy trying to harm me? Can they have dairy? All of these questions and more… won’t be answered by me. The game took some time for me to get my mind around the basic controls (read that as the jump was more floaty than I expected) so I haven’t beaten the game, nor do I see myself able to do so any time soon. There’s always another mechanic or level-type setup introduced that will get me. One day Gadget, one day. These bonus upgrade/trade rooms are neat in concept, but I’ve yet to succeed in them. In fact, every time I trade something to any form of robo-friendly, I’ve gotten cursed somehow. I’ve actually stopped giving them anything. I’ll hold onto my scrap, thank you very much! So is the game too difficult? That’s a definite: yes and no. When I first fired it up, I just ran into the game at full speed. 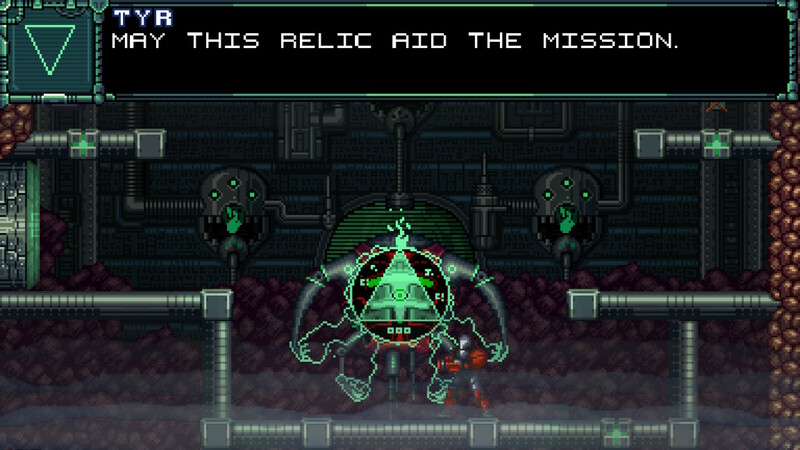 I’ve watched enough speedruns of the Metroid games and this gave me the same vibe. (It’s the freaking timer on the top of the screen that sits there ever mocking my progress.) So off I went! I just ran in there and jumped and broke stuff and eventually died… multiple times. The movements of the enemies are all based on nostalgic gameplay. Left/right/diagonals, traditional pathing is what you’ll find here with very little surprises. 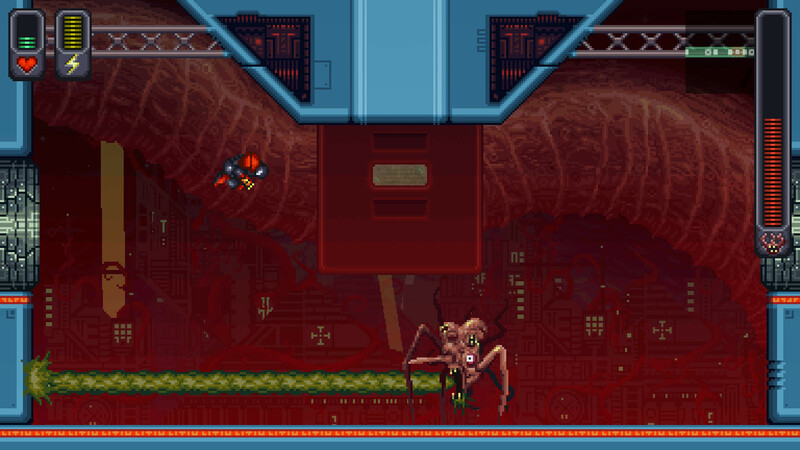 The one enemy that really stood out to me was this funky-looking flying snake-like creature that reminded me of the alien that jumps out of Kane’s chest in Alien, but only if it could fly and pass through walls like a punk. Of all of the things that will kill you, these wouldn’t be it. They’d be the things that plink damage off of you. The bosses are what will kill you. I’ve fought four different kinds now, and they do switch them up on you, but none have been too difficult except for the fourth type I encountered. (Technically, some of the bosses can be difficult until you recognize their pattern and then it seems like they just want to die with how easy they go down.) Basically, the boss was floating around a level with no stable flooring or flooring that wouldn’t literally bite me. It seemed a little unfair, but I probably just didn’t notice the trick yet. This is a picture of the floating jerk that offed me pretty easily. Although this picture seems to be missing all of the crap the boss shoots and the floors don’t look like they have the biting guys in them. I would have preferred this version of the boss. This guys killed me once. I’m kind of embarrassed to say that because he’s now a walk in the park… and ugly. As I mentioned above, the controls did take some getting used to. The jump was a bit more floaty than I would have liked, but that was overcome. The one thing to me that remains funky is the aiming. I don’t mind aiming in the eight specific directions, but it feels imprecise, it was hard at times to point directly up instead of at an angle or jump and aim straight down. I tried out both sets of joycons and my Pro controller. 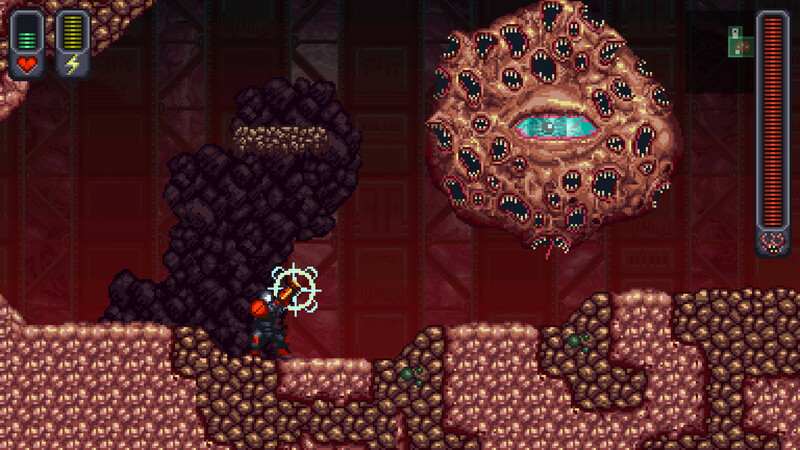 This was circumvented by moving around the level and getting the baddies to come to my gun rather than using more precision, but that wasn’t always viable. Luckily, I didn’t notice getting much for killing enemies other than points/health/energy so I can still sleep at night if I didn’t need any of those. When I took a more methodical approach, it went a bit smoother even if a boss did end the run eventually. To think I was nearly writing this game off. 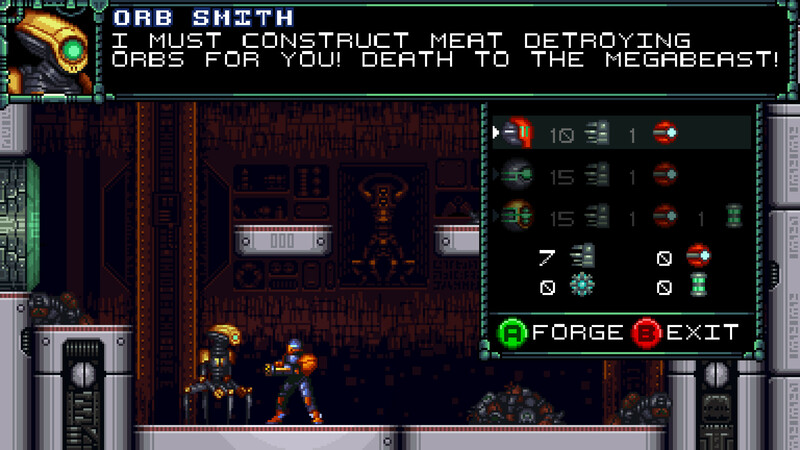 At first, the game didn’t grab me more than a “I want to be the next Metroid“. I don’t feel that that is the case at all and more like A Robot Named Fight! 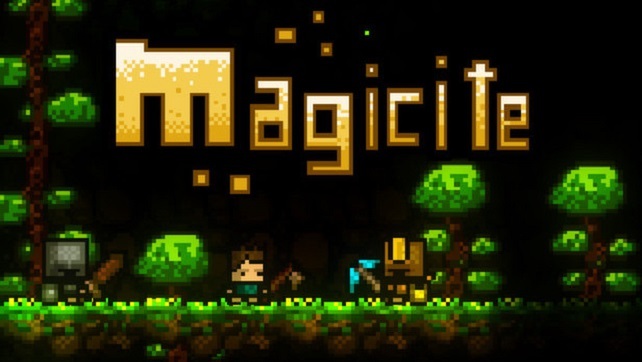 is kind of a loving tribute to those types of games. There are similarities for sure, but it can stand by itself rather easily. I like how more weapons are unlocked as you progress and the possibility of having no run be the same is cool. However, since they have the ability to play with the last seed or variation, I’ll probably find one that I like and run with it in order to progress further and see how the rest of the story pans out. While A Robot Named Fight! may not rock your world, it is a solid title and well worth a try.